With wit and humor, Drs. Shu and Jana allay the feelings of anxiety, guilt, and inadequacy that inevitably plague first-time parents home alone with a newborn, providing authoritative yet compassionate advice for the sleep-deprived and overwhelmed! Heading Home with Your Newborn has everything new and expectant parents need to know about caring for baby in the first few months after birth. Written by two pediatricians who are also parents, this awarding-winning guide covers feeding, sleeping, changing, bathing, dressing, traveling, sickness, child care options, and much more. "This book packs the advice of a parenting class, a doctor's visit, and a best friend into one indispensable package." "... Informative, realistic, and reassuring, this book not only empowers moms with the knowledge to raise a happy and healthy baby but also -- and most importantly -- gives us the confidence to believe that we can." 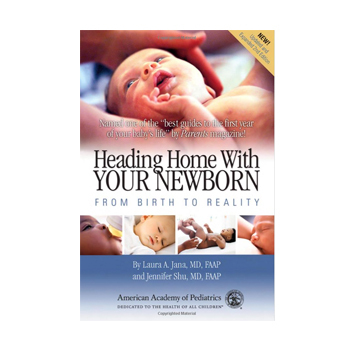 "One of the "best guides to the first year of your baby's life." "I LOVE, LOVE, LOVE the humor in Heading Home! Very entertaining and informative. I am now recommending that all my new parents get a copy, whether they are on their first or fourth baby." "Heading Home With Your Newborn is one of the very best books for parents that I've run across in the 24 years that I have been reviewing parenting books. Written with great heart and soul, it provides up-to-date medical information. These two pediatrician authors are both smart and compassionate, and it's obvious that they remember just what it feels like to bring home a brand-new baby." "A special book that new parents will want to read cover to cover before their little one arrives. No matter what challenges new parenthood throws your way, Drs. Jana and Shu are sure to leave you feeling both confident and competent." "The advice you'd get from your sister or best friend, if she had her baby only last year." "Its spirited, light, and conversational tone makes readers feel like they are talking to a trusted good friend who happens to be a pediatrician." "This book packs the advice of a parenting class, a doctor's visit, and a best friend into one indispensable package. Highly recommended for public libraries."